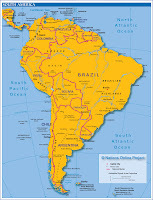 I'm headed to South America tomorrow with the husband - we land in Santiago, Chile early Wednesday morning. A few days later (after tracking down a place that airs the VP debates!) we head to Cusco, Peru and Machu Picchu and finish the trip in rockin' Buenos Aires. Hasta luego! It was a pleasure to blogroll Maria Energia at Chemistry for a Sustainable World.